It seems a little odd to praise a graphic novel for it’s subtlety when its main character is a child born with eyes on the opposite sides of his skull and who gets an adopted sister halfway through the book who’s a chimpanzee. But its the subtleties of the story that really make The Ticking by Renee French, and published by Top Shelf, a very powerful book. Actually, the surreal elements of the story never seem that oddball or out of the ordinary since they’re presented so matter-of-factly. French can throw just about any outrageous stunt at us and we’ll accept it. That’s just the way the world is in her vision. Nobody ever really comes right out and calls the main character, Edison Steelhead, a freak even though he certainly looks like one. We see him and must judge him for ourselves. French will not make that judgement for us and taint the path on which the book’s journey goes. The main subtleties of The Ticking is in the handling of the central relationship, the one between Edison and his father. This is a quiet tale, told with minimalist dialogue — both exterior and interior. It’s all primarily from Edison’s point of view so the motivations and emotions of the father are never expressed outright. The father’s dialogue is pretty much contained just to statements of fact and direct orders. The reader is put directly in Edison’s head as we are left to infer the dad’s objectives as much as he is. The plot evolves rather simply. I don’t want to give much, if any, of it away because the book’s central power is when we are finally able to put the small pieces together and the emotional undercurrent to the story is suddenly revealed as clear as day. There isn’t a moment in The Ticking when French swoops in, like the hand of God, and pokes us into full realization. We have to grow into the moment exactly the way Edison must grow from childhood into maturity. During that growth, Edison expresses himself through art. 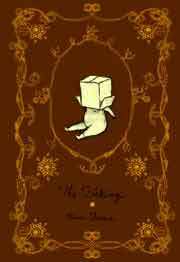 He and his father live in relative isolation on a tiny island and since the child cannot connect with the parent at all, he is forced to make sense of the world through reproducing it on paper. As the father only speaks directly, Edison makes direct reproductions of the things he sees, mostly bugs and tools. In this, father and son are probably alike even though they do not see it. Thus they are driven the furthest apart when the son doesn’t follow in the father’s footsteps — a moment I don’t want to spoil here, so I’ll just say the difference is driven by physiology. The distance between father and son takes a physical form when Edison is introduced to his “new sister,” a chimpanzee named Patrice, who soon receives all of dad’s time and attention. Patrice also symbolizes Edison’s final leap into adulthood, in which he’s forced to leave the island on his own. On the surface, it does seem as if these are just odd-looking creatures doing odd things. But in a very minimalist style — and that’s story-wise, not art-wise — French is able to tap into rather deep, universal emotions. This is the struggle most kids must go through in dealing with their relationships with their parents. Except that most kids don’t have to do it with a chimpanzee as a sister. I hope. And what’s interesting is that although there are some surreal elements to French’s artwork, particularly in the design of Edison and his dad, her pencil shading techinique lends an almost photorealistic quality to her drawings. That would lead me to assume that there’s some sort of autobiographical truth to the story on an underlying level. And again that would be without the chimpanzee. I hope. Buy The Ticking at Amazon.com!